Joel Fan's second album for Reference Recordings, further solidifies his reputation for innovative programming and dazzling keyboard technique. Drawing on composers from North and South America, Fan makes brilliant work of major sonatas by Ginastera and Barber, along with "entertainments" by Gottschalk, Piazolla and Villa-Lobos. Of particular interest are two little-known works by Amy Beach and the African-American composer Margaret Bonds. Another highlight is the world premiere recording of a recent suite by William Bolcom! Any piano enthusiast will enjoy this wide-ranging recital, recorded at Skywalker Sound by RR's renowned technical guru, "Prof." Keith O. Johnson. 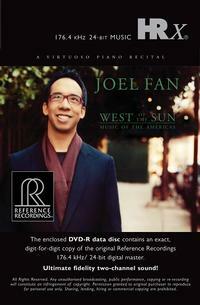 World Keys, Joel Fan's debut CD, hit the Billboard chart at No. 3, so expect great things from this new release. BARBER: Piano Sonata, Op. 26: Allegro Con Spirito.